Civilized man has fortunately retained an instinct for holding on to the reality of his undisputed identity as an integral part of the universe. Colonel Richard Lieber, an ardent conservationist whose unstinting efforts gave Indiana its exceptional state park system, used to quote Francis Thompson: "Thou canst not stir a flower / without troubling of a star." An astute observation, certainly, projected to its not illogical conclusion. It is undoubtedly this feeling for the homogeneity of all creation that prompts so many of us to get outdoors and "back to nature" as a respite from the travail of everyday living. Henry David Thoreau succinctly explained his personal motivation: "I went to the woods because I wished to live deliberately, to front only the essential facts of life, and see if I could not learn what it had to teach, and not, when I came to die, discover that I had not lived." The importance of reserving space for what we have come to call recreation has long been understood. The first American settlers provided their towns with commons or village greens, and as communities grew larger they included parks in their civic planning. As the nation's westward expansion proceeded in earnest after the Civil War, thoughtful people advocated conservation practices to insure the protection of suitable lands and waters for public enjoyment. Although their influence was initially only slight at a time when the store of such natural resources seemed inexhaustible, they scored a remarkable early success with the establishment of a state park in the Yosemite Valley of California in 1864, and with that the movement got well under way. Congress acted as early as 1832 to reserve acreage in the Hot Springs region of Arkansas for public use, but the first area (first in the world, in fact) to be designated a national park was Yellowstone, in 1872. This was done at the urging of three men from Montana who had explored the region in the northwest corner of their neighboring Territory of Wyoming in 1870 to investigate the reports of fantastic natural phenomenahot pools, geysers, and volcanoesthat had been circulated for over fifty years by hunters and trappers, who were the only white men to have visited the area. The Montanans not only confirmed these tales, which until then had been taken only lightly, but also described the awesome beauty of Yellowstone's canyons, waterfalls, and forests. Actual photographs of these natural treasures made the following year by a United States Geological Survey expedition helped to convince Congress that the area should be set aside and protected as a primeval wonderland. In 1890, Congress designated Yosemite as a national park and added two others in California, namely Sequoia and General Grant National Parks. From these beginnings a large and diversified system of natural, historical, recreational, and cultural areas was developed which in 1972, a hundred years after the first national park came into being, totaled 284 units through out the country. In the early years of the national park movement, the parks were almost wholly inaccessible to visitors. The basic reason for establishing them was to prevent their unique resources from being exploited for profit by the lumber and mining industries which were then avidly seeking to penetrate remote parts of the West in anticipation of high returns on their investments. Gradually, however, railroad lines were built to serve park areas where practicable, and roads were extended or improved when the age of automobile travel arrived. In 1970, near the end of their first century, the national parks reported a year's total of 172,307,500 visitors. With public use of all types of areas in the system increasing exponentially over the years, the main problem for park administrators became one of protecting them not simply from commercial exploitation, but rather from the erosive effect of heavy use by the park visitors themselves. This has continued to be a peculiarly baffling problem. The parks are for the people to use, and the people are encouraged to use them, but it has been aptly said that now the parks are literally being loved to death. How, then, can the irreplaceable resources of these areas be preserved for the veiny people whose intensive use of the parks threatens to destroy or at least impair them? This is the challenge that led me into park planning and administration, for I had been cognizant of it throughout my childhood as I watched my father wrestle with the problem in developing and administering the municipal park systems of two large cities in the East and Middle West. I was actually born in a park and lived in parks until I left home to attend preparatory school and then college, where I majored in landscape architecture. Professionally, then, I am a landscape architect and plannera land-use planner, that isthroughout a career that brought me major responsibilities in my professional field and in management. My father, Theodore Wirth, a horticulturist, professional park planner, and administrator, immigrated to this country in the late 1880s from the oldest democracy in the world, Switzerland. According to the custom in those days, after getting his education in his home country he served an apprenticeship of four years in park work abroad, in Paris and London. When he arrived in America he got a job working as a tree trimmer in New York City's Central Park. Within two or three years he worked up to the position of sub-superintendent of Riverside Park, an area extending along the Hudson River for about a mile north of Seventy-second Street. A change of city government left practically all municipal employees without jobs. This abrupt unemployment came as a shock to Dad, who was inexperienced in the spoils system of New York City politics of that time, and he decided that working for the city was not for him. He found private employment on the Perkins estate at Glen Cove, Long Island, under a Frenchman, Felix Mense, a horticulturist who was head gardener, or manager, of the estate. The connection proved to be the most important of his life, because a few years later he proposed to the elder of the boss' two daughters, Leonie, and was accepted. Soon afterwards he accepted an offer to become superintendent of parks in Hartford, Connecticut, where he began his long and distinguished career. 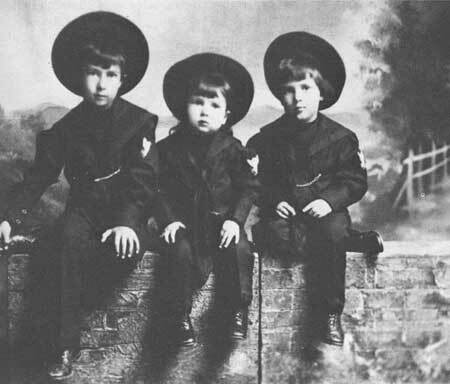 The Wirth brothers, Theodore, Walter, and Conrad, in Hartford, Connecticut, just before the family moved to Minneapolis, Minnesota. In Hartford we lived in the superintendent's residence in Elizabeth Park. I always get a great deal of pleasure going back there to see the beautiful rose garden my father built, the first recorded municipal rose garden in the United States. It has changed very little and people by the thousands visit it every year. Having established a sound reputation through his work in Hartford, Dad began to receive offers from other cities as early as 1903. He and Mother really had no desire to leave Hartford, where he had taken his bride and where their three sons had been born, but the die was cast after he accepted an invitation from Charles Loring, a prominent businessman in Minneapolis, Minnesota, and a member of the city's park commission, to come out and meet with them. He found the city very much to his liking. Minneapolis was then a small but growing town with great potential. It had very few parks but a lot of lakes, rivers, and other possibilities for park development. The park commission made him an attractive offer which included building a house of his own design in one of the parks as his official residence. In 1906 the Wirth family moved to Minneapolis and it was there that Dad thoroughly enhanced his reputation as a park planner and administrator. Our house was built in a new park not far from Lake Harriet. It had a first floor at the level with the top of the hill it was built on. It had a second floor with four bedrooms and a big sleeping porch. The third floor had two bedrooms and a big storage room. In the basement level underneath the porch on the first floor, there was an office and a big drafting room with four drafting tables. The house was on the outskirts of Minneapolis and to get to school we had to cross farmlands in the winter but had to go around them in the summer. We went on skis in the winter and in the spring we played on the rubbery ice of a pond near the school. When the weather started to warm up, the ice would soften and some ten or twelve of us kids would link arms and run back and forth across the ice and watch it sort of wave in front of us. The more we did it the looser it became and then we'd have to gradually start cutting down the size of the gang. It was always exciting to see who could make the last run across without falling in. Dad proved himself an imaginative planner and excellent designer and was one of the first park administrators to establish a professional recreation department as part of his organization. His plans provided for parks around all the natural waterways and lakes, a playground within a quarter mile of every child, and a complete recreation center within a half mile of every family. He was fortunate in having as his principal assistant Chris A. Bossen, who had served in this capacity in the Hartford days. I have fond recollections of Mr. Bossen and his family. Chris' administrative skill was a perfect match for Dad's creative ability. He succeeded Dad as superintendent of the Minneapolis park system when my father retired in 1936. The park superintendent's house in Lyndale Park, Minneapolis, Minnesota. With Dad settled for what proved to be the rest of his professional career, we were a happy family in an ideal setting in Minneapolis. Mother ran the household with the same deft, sure hand that Dad used in running the parks. In addition to three lusty, growing sons, she had a tempermental, intelligent, hardworking husband to handleone with the old country notion that the father was really the head of the house. But Dad knew that not all the skills of his calling were in his sole possession, for Mother was no mean horticulturist herself. It was she who taught my brother Walt and me how to build and take care of a garden, even though at the time it did seem to us that she was merely trying to keep us occupied and out of mischief. We had to respect her expertise, for she was an active member, and several times president, of the Ladies' Horticultural Society. Mother died in 1940 in her 65th year, and only Dad and Mother's sister, Aunt Juliette who had never married, were left in the family home. About two years later we three boys received wires from Dad stating that Juliette and he felt that the neighbors were beginning to talk and they had decided to get married if we didn't object. Within 24 hours Juliette and Dad received three wires from different parts of the world expressing our delight over the good news. I might say that the Swiss immigrant had not only had a successful career in his adopted country but had really hit the jackpot in marrying his boss' two daughtersthe dearest mothers any boy ever had. 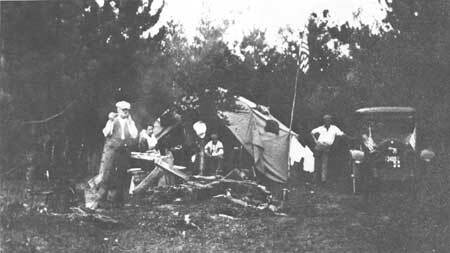 The Wirth family, about 1916, on a camping trip to Lake Itasca State Park, Minnesota. Conrad took the picture, with father and mother on the left, and brothers, Walter and Ted. During the course of my father's long career in park management, he made considerable contributions to the field. He was one of a group of about a dozen park men who met in Boston in 1898 and formed an association of New England park superintendents, the first professional organization of its kind in the United States. At the time of his death, in 1949, he was the last surviving charter member of the organization that became the American Institute of Park Executives, which in turn was combined with other groups to form the National Recreation and Park Association. I have been a member of those organizations since 1924, and my brother Walter was a very active member from 1926 throughout the rest of his career, holding the office of president several times. I was president of the American Institute of Park Executives, as Dad had been, and I am still a member of the National Recreation and Park Association; my son Ted is also a member. My older brother, Theodore, ignored the family tradition of horticulture in favor of a career in the United States Navy, reaching the grade of Admiral. Walter, however, followed in Dad's footsteps, first in private practice with me in New Orleans, then on his own in the Tulsa, Oklahoma, park system, and later becoming superintendent of parks in New Haven, Connecticut; director of Pennsylvania State Parks; and superintendent of the Salem, Oregon, Regional Parks. Cadets Wirth and James in rowing shell on Lake Nagawicka at Saint John's Military Academy, Delafield, Wisconsin. My brothers and I attended Saint John's Military Academy at Delafield, Wisconsin. At Saint John's they put each new cadet in one of the two clubs, the Kemper Club or the Dekoven Club, and he belonged to that club throughout his stay at the academy. The two clubs competed with one another both athletically and scholastically. I was a Dekoven and, in my last year, one of the five directors. Dr. Smythe, the headmaster and a Kemper, refereed some of the athletic events. I remember one of the last things before graduation was the shell race on Lake Nagawicka. 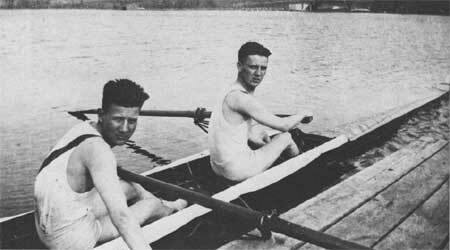 The Dekovens felt certain that we had won both the heavyweight and lightweight shell races, but the headmaster's decision was in favor of the Kempers. Then in the cross-country race a Dekoven man came in first, but the headmaster ruled a foul on him, which gave first place to a Kemper. The Dekoven Club decided to make our feelings known to the headmaster, and I was detailed to do it. I was "officer of the day" and in full dress uniform. I went to the headmaster's office, saluted, and told him the Dekovens felt that the decisions on the boat race and the cross-country race were wrong and therefore unfair. He replied, "Is that all?" I said, "Yes, sir." And he said, "You are dismissed." I saluted and left. I was disturbed that he did not discuss the matter with me. The day after this incident was graduation day. In handing out the yearly awards they always left to last the most important one, the Delafield Medal for the most worthy cadet. I hadn't expected anything and was surprised when I was called up and presented with the medal. I was a little sorry about what I had said the day before, and I think maybe the headmaster realized that, because in passing me he stopped and said: "I want you to know you were awarded that medal before our interview the other day. And I also want you to know that when you came in and spoke your mind I realized that we had made the right choice." He further said his decisions were right, "however, you have a right to express an honest opinion and we admire you for it." Officer of the Day Wirth at Saint John's Military Academy, Delafield, Wisconsin. From Saint John's I proceeded to Massachusetts Agricultural College, now the University of Massachusetts. Here my preparation for a career in park and recreational work began with the business of earning the bachelor of science degree in what was then called landscape gardening. I studied under Professor Frank A. Waugh (known to the students as "Pinkie" when he was not around), who was my father's choice of teachers. He could not have selected a better one. Professor Waugh went into depth on the relationship between man and the natural environment. He and his assistant, Professor Harrison, an engineer, believed that man-made landscape developments, to be successful, must meet the needs of the people and that the natural elements were a part of these needs. They proceeded on the principle that man's advanced culture and social development required certain modern conveniences but that these utilities should not be ugly or destructive of the needed natural environment. In fact, certain professional societies in those days would not recognize Waugh's graduates because of this conviction. The landscape profession then was oriented more toward the formal types of landscape design. Professor Waugh felt that the term landscape architecture implied formal design and the destruction of the natural environment. He preferred the old term landscape gardening as more descriptive of the type of landscaping best suited for park and home improvements. Generally speaking, his concept has proven correct, and time has adjusted the meaning of the term landscape architecture to agree with the spirit of Professor Waugh's concept. Many landscape architects today, however, are using the term land planner, considering it more descriptive of the type of service provided. Really, the terms land planner and landscape architect are interchangeable with reference to the type of work these professionals are called upon to do. They are trained to provide plans for land uses that will best serve, over the long term, the environmental requirements of the people. On arriving in Amherst, I stayed with the Waughs for a month before moving to a rented room in a home. Of course Professor Waugh had invited me, but I believe I stayed longer than he intended. When my father gave me the money I would need to pay for my room and board for the first month, he warned me to beware of gamblers and thieves on the train. But I had to learn the hard way. I got in a poker game on the train between Minneapolis and Chicago on the invitation of a couple of seemingly very nice, friendly gentlemen. I guess the usual routine followed, and my money for room and board for September was soon gone. I applied myself pretty thoroughly to my landscape studies, but I had trouble because of extracurricular activities; in fact, I actually found myself below the average student. Actually, I wasn't a bad student in the subjects I liked: landscape architecture, planning, engineering, physics. Languages always gave me trouble and still do. We had to have two languages in addition to English in order to be graduated, and I never could fully understand why. I made the freshman football and basketball teams and did a little track work. I never made any of the varsity teams, although in trying I lost two front teeth tackling somebody from the rear, had my Adam's apple stepped on good and hard, and broke my collarbone and my right leg. 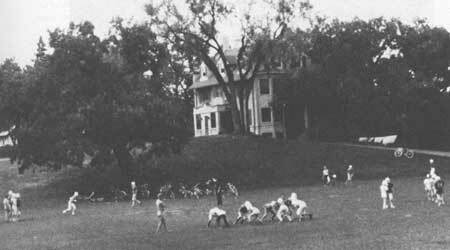 There were plenty of social activities at Mass Aggie, too. I was asked to join the Kappa Sigma fraternity, which I did. And there were two women's colleges nearby, each only a half-hour streetcar ride from Amherst: Smith College, at Northampton, and Holyoke College, near Holyoke. There were about a thousand male students in Amherst College and Massachusetts Agricultural College in Amherst and some four or five thousand women at Smith and Holyoke.